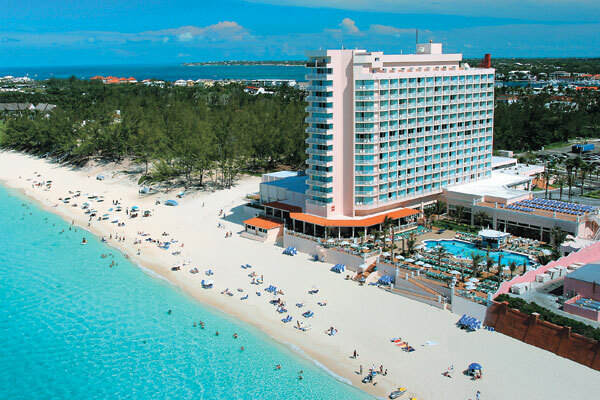 The Hotel Riu Palace Paradise Island occupies an enviable beachfront location in one of the most desirable spots in the Bahamas. As if that wasn’t enough, this mostly adult-oriented retreat offers rooms and suites that are of high quality and general facilities that are rather complete. Add in the stress-free all inclusive rates, and it is little wonder why so many travelers make this their lodging choice for Caribbean vacations. The living is definitely easy. At the Riu Palace Paradise Island, guests can indulge in a variety of activities. Swimming or sunning at the beach is among the options, and there is a freshwater pool to take advantage of as well. Other ways to stay busy include playing beach volleyball, taking a dip in a relaxing hot tub, working out at the gym, and playing table tennis. When hunger or thirst sets in, guests of the Riu Palace Paradise Island can choose from a number of onsite bars and restaurants. There is even a 24-hour sports bar, and snacks are available around the clock. Dining in is also an option, thanks to the 24-hour room service. Additional fees may apply for some activities and services. An example would be spa treatments and certain water sports. Paradise Island in general offers a healthy array of activity choices. The nearby Atlantis Resort, for example, features an aquatic park, an aquarium, and a casino. Two bridges link the island to the city of Nassau, where such things as museums, a zoo, a botanical garden, and duty-free shopping await. After a long day, Riu Palace Paradise Island guests should have little trouble achieving relaxation in their rooms. Comfort is the name of the game in the stylish, upscale guest units, and the standard in-room amenity list is impressive. Liquor dispensers and mini bars are just two amenity highlights.